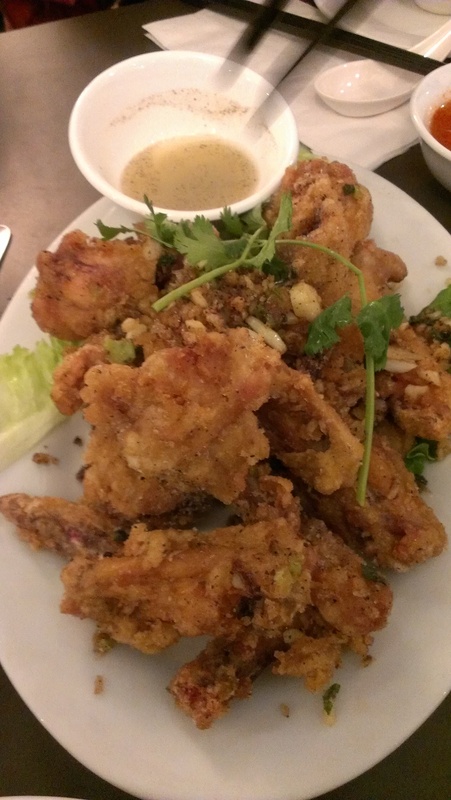 I’m not sure where you’ve been if you’ve never heard of Phnom Penh and their famous buttery garlic chicken wings! It’s always on the list of most talked about restaurants on Urbanspoon. My friends and I went after our rock climbing session at the Cliffhanger which was really cool by the way. It was my first time and I felt accomplished after. ^__^ Not that I was scaling really difficult walls though but it did get a bit scary when I was stuck in the middle! We went to Phnom Penh at 5:30pm and we were told that there was going to be a 45 min wait. Located at 244 E. Georgia, it’s pretty much right in the middle of Chinatown. It also seems to be operated by Chinese people but that’s not a problem to me. Coincidentally it was also a Saturday night so the Chinatown night market was just getting ready to open up. It feels superbly tiny compared to the ones in Richmond. They also had a couple of food trucks there too. Otherwise it was severely lacking in merchandise and of course FOOD. 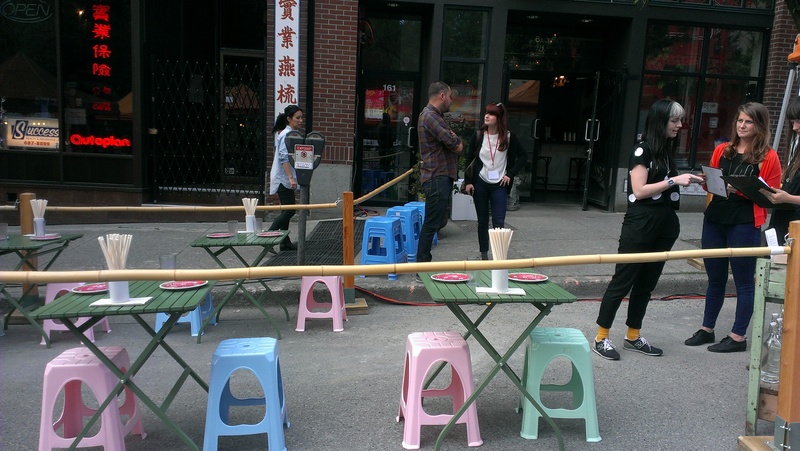 Before I get on with the food part of this post, I just have to mention that Bao Bei Chinese Brasserie had this adorable Chinese style street food patio area! 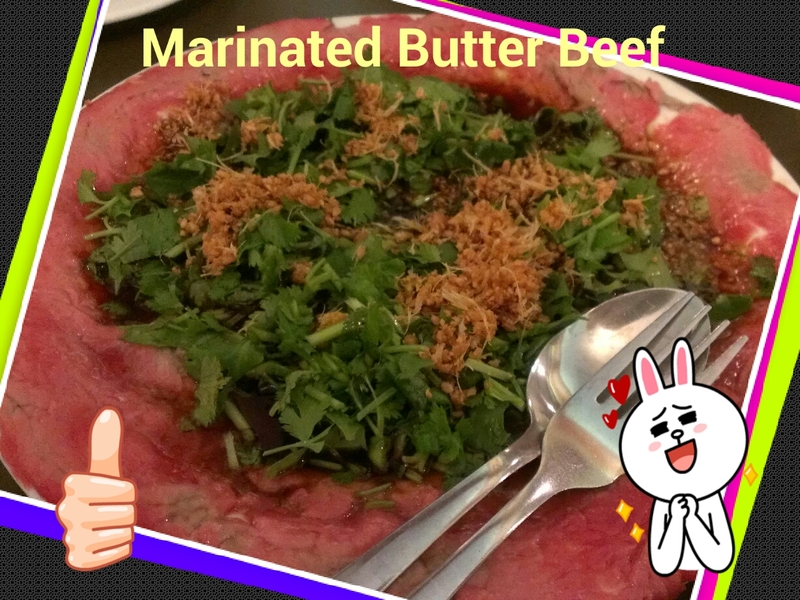 The other must try dish from Phnom Penh, according to food reviews is their Marinated Butter Beef. The lightly seared beef was doused in a sweet and tangy dressing similar to balsamic vinegar I think. There was also a pile of cilantro and garlic chips on top. I found that there was too much cilantro but it did make the presentation a lot nicer than just having a pile of beef on a plate. The beef was a bit chewy but fairly soft and I loved the dressing for this since I love sour things like salad dressing. I also read a review for this and it seemed like a lot of people ordered it. 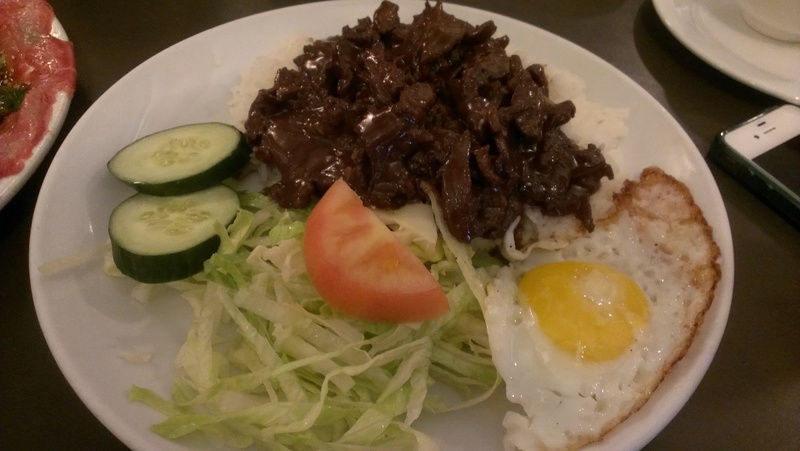 This is the Beef Luc Lac on Rice with Egg. It was a accompanied by a bit of salad. I found the beef to be chewy as well and I wasn’t that fond of the sauce but it was alright. I also expected the egg to be more on the poached side. I didn’t find it that good so I probably won’t order it again. 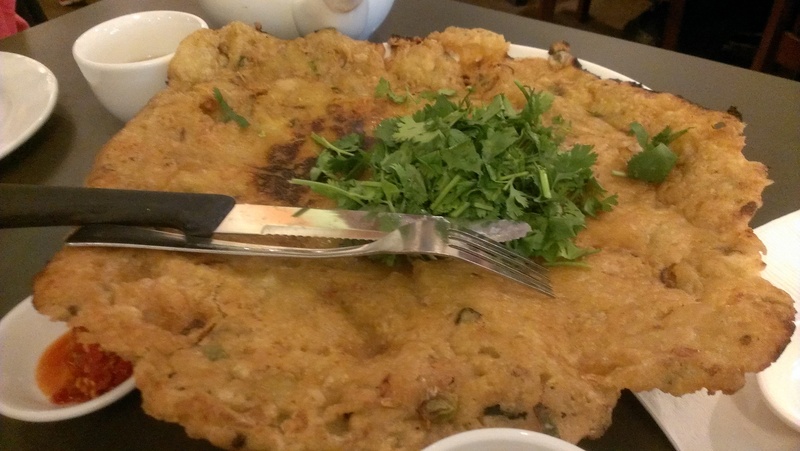 Next we had the Oyster Pancake. It was larger than I expected and the sides of the pancake flowed over the sides of the plate. Or they gave us a smaller plate to make the pancake look bigger! :O The crispy exterior was a nice contrast to the soft interior which contained a lot of large oyster pieces. The oysters were mostly in the middle so the crispy sides were essentially just batter. I didn’t really think the cilantro was necessary for this dish though and I was getting sick of it after eating a lot of it from the butter beef. But anyway this was delicious as well (anything fried is)! Finally we have their famous Buttery Garlic Chicken Wings! These are extremely similar to the deep fried frog legs and they essentially tasted the same except for the texture of the meat. At first we weren’t sure if we should have deep fried chicken wings and frog legs but we decided to do it anyway. YOLO! They were salty and peppery and the meat was still moist enough. These were really good too but compared to the frog legs I think I liked the frog legs better. It might be due to the novelty of frog legs and the texture was softer too making it easier to eat than chicken wings. Nonetheless, these were quite addictive too and they were served with the same lime and salt dip. 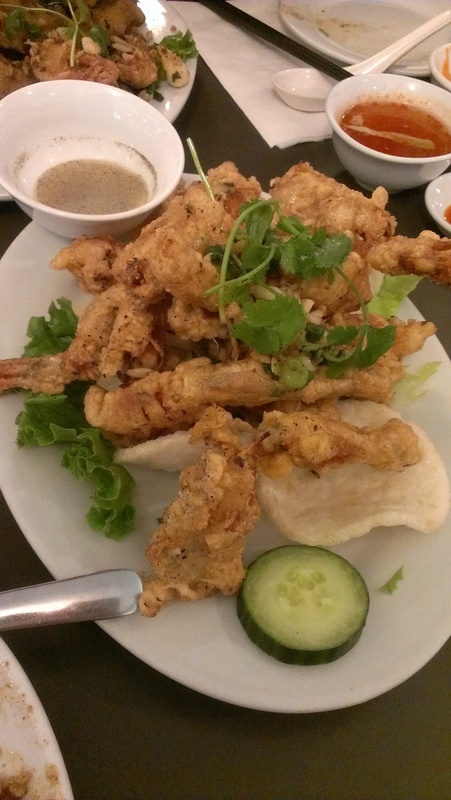 This entry was posted in Food Reviews, Vietnamese and tagged Bao Bei Chinese Brasserie, Chinatown, deep fried chicken wings, frog legs, oyster pancake, Phnom Penh.